Decouvrez ici la vie à la douceur des caraïbes ! | Discover the gentle Caribbean way of life here ! Villa Photos - On smartphones, best viewed in landscape mode. Rotate to landscape mode and touch image for descriptions. Ouanalao is a new (2018) upscale 2 bedroom villa with its own 23ft (7m) long pool and a wrap-around terrace situated high above Flamands Beach in Saint-Barthélemy, French West Indies. It's named after the original 10th century Arawak name for this exceptional island (visited by Christopher Columbus in 1493 and named for his brother, Bartholomew). 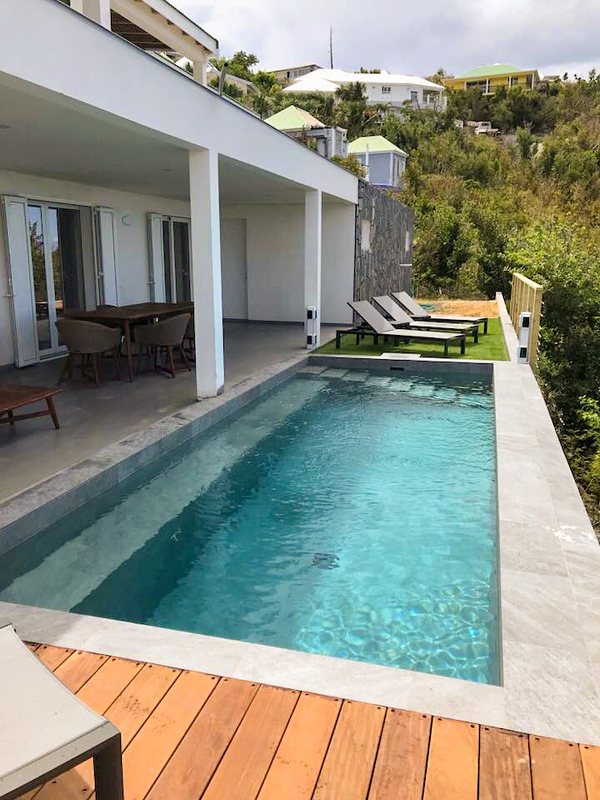 Ouanalao is a completely independent part of a larger new luxury villa (currently unoccupied) just off the D210 road from Gustavia and the Airport to Colombier, after the turns for Anse des Flamands (right) and Corossol (left). It's further down the local road (chemin communal) from the La Petite Colombe Boulangerie - Patisserie - Traiteur (where you may procure your delectable breakfast croissants and pastries) and Les Bananiers Restaurant in the Quartier Boisneuf, just before the first major ascent towards the top of Colombier. 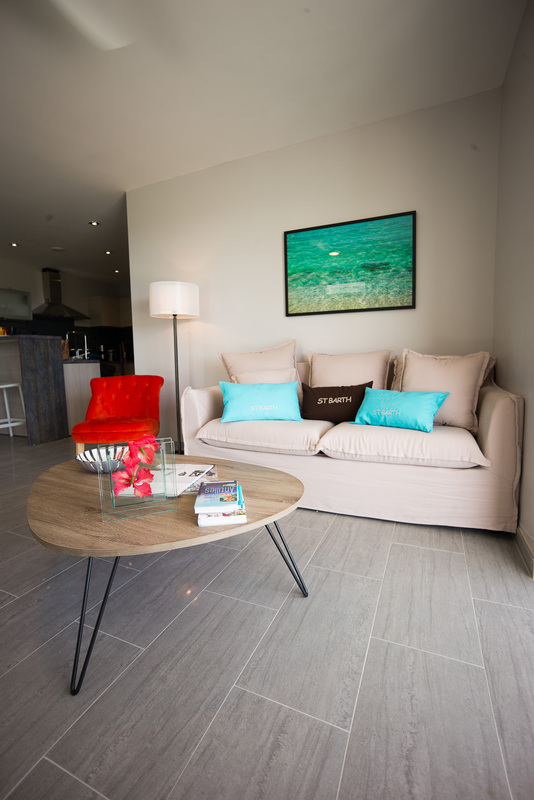 The villa is quietly nestled off the road, yet a short and easy drive from Gustavia or the Airport in St. Jean. From this hillside perch above Flamands Beach, you'll find privacy, solitude and respite from your quotidien. Ouanalao has a separate entrance, driveway, parking and garden. It has good sound proofing and privacy, as well as dual sundecks for maximum enjoyment of the morning and afternoon sun. It has the feel, intimacy and experience of a full-fledged villa. Nearby beaches are Flamands (excellent sunbathing), Anse des Cayes (good for surfing), Colombier (also called Rockefeller Beach for historical reasons; requires a nature hike and worth every step) and St. Jean (water sports, sunbathing, airplane spotting, Nikki Beach Club, Eden Rock Hotel). Ouanalao is close to shopping in St. Jean (groceries - Marché U, bank ATM (BRED), La Parapharmacie and other essentials) and Gustavia's delights (duty free luxury stores such as Hermès, Louis Vuitton, Cartier, Bulgari, Prada, Dolce e Gabbana, Gaastra for sailors; local boutiques; bars and restaurants; more banks; marina and ferry; morning fish market - often fresh langouste). 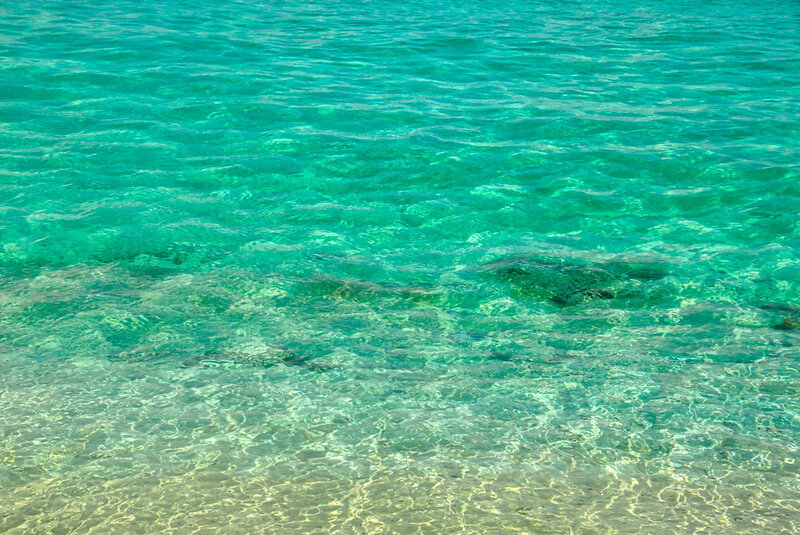 Weather: Wherever you live, it's almost always better on St. Barthélemy. Below is the proof / en voilà la preuve ! Ouanalao has magnificent unobstructed views over Flamands Beach, the uninhabited Îles Chevreau (billy goat), Frégate and Toc Vers, the marine preserve, and towards the south, the roofs of the white super-luxury villas of Pointe Milou. And most of all, the endless deep sapphire blue of the open Atlantic. It's at this point of St. Barthélemy that the Caribbean Sea meets the Atlantic - land's end until Africa to the Northeast (Mauritania, 4,300km / 2,700 mi). Here your cares quickly dissolve as you watch the infinite variety of billowing cloud formations. If the Atlantic view is blue but hazy, that's probably the extremely fine Saharan sand in the atmosphere. Don't be surprised if the overnight wind deposits a few grains on the terrace. Let your spirit be transported as well. At Ouanalao you'll enjoy inspiring, peaceful sunrises over the Atlantic. Every morning bestows a different miracle. At day's end as the sun sets from the St. Martin side of the island, Colombier casts its shadow on the uninhabited, protected islands facing you, revealing subtle changes in character. Then, at the far end of Flamands, sunlight and clouds reflected on the water create a rare, delicate dance of sea angels, typically between 5:30 and 6:30pm. Soon this magic potion of sun, breathtaking views, warm water and constant trade winds (les Alizés) works its potent cure. The first wonderfully carefree day blends into the next, then a third, punctuated only by the most deep, restful sleep. Time slows. You're now uncertain which day of the week it is. Nor longer care. The treatment is successful. When your island idyll finally comes to an end, you tell yourself that it's only a pause, since you are already planning your next dose of this intoxicating elixir. VILLA OUANALAO Supports POST-IRMA Tree, Plant, DUNE and Coral Restoration INITIATIVES. Mural at SAILing SCHOOL AT NEAR-BY St. Barts Yacht CLUB. SMALL SAILBOAT RENTAL AVAILABLE. Pool & Decks: Incredible rectangular heated swimming pool (7m (23ft) L) with ocean view in front of the living room and bedrooms. In-pool banquette (bench) offers infinity views. Two sunning decks; 4 comfortable de luxe lounge chairs (transats) and 2 matching tables. Living Room (salle de séjour) with Breathtaking Unobstructed Ocean View. Galet (pebble) coffee table (table galet), plush armchair, TV / media center, floor lamp; elegant Haiku-L ceiling fan Air conditioned (split unit). Approx. 13 m2 / 140 ft2 (with dining area and kitchen: 36.2 m2 / 390 ft2). Separate Dining Area (coin-repas). Round table with 4 chairs (plus 2 seats at nearby bar), contemporary custom-made wall-mounted sideboard (buffet). Unique suspended lamp with nest shade. Teak and wicker outdoor dining set for 6 - 8 persons. Two Bedrooms - Same Ocean View. One with king size bed; one with joinable twins. 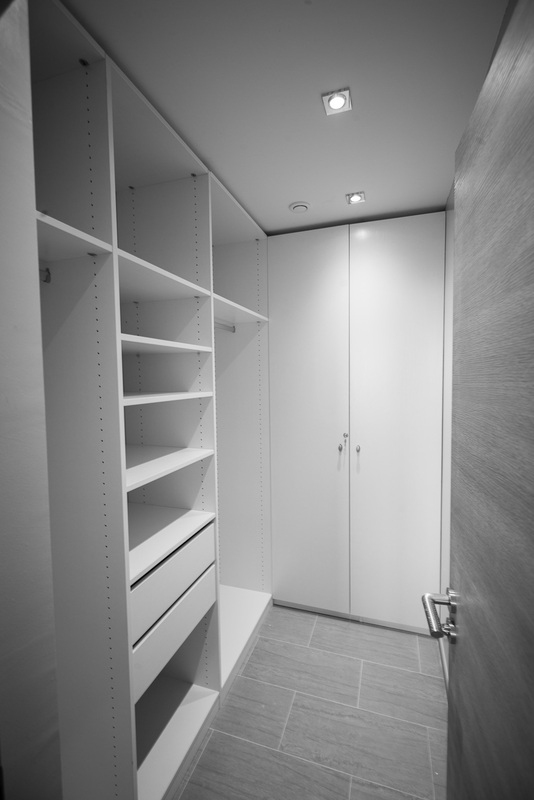 One with walk-in closet (le dressing), the other with clothes armoir. 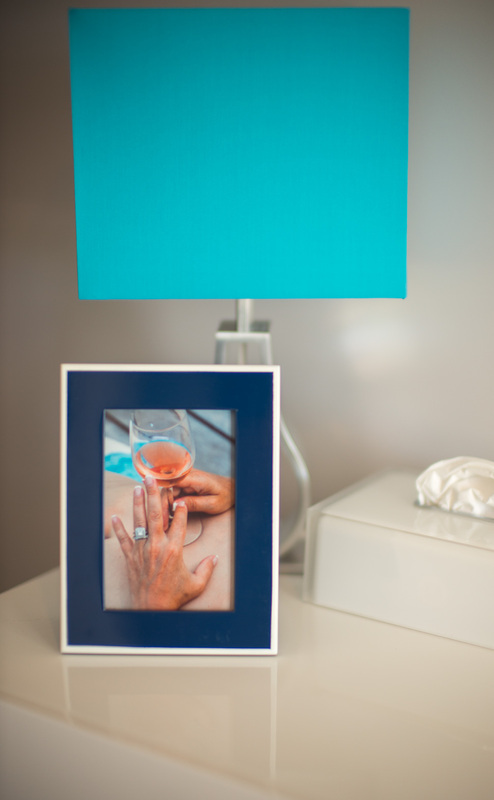 Nightstands (chevets) and table lamps. French mattresses; French and German linens. Each with elegant Haiku-L ceiling fan and air conditioned (split units). Each BR approx. 12 m2 / 130 ft2. Convenient adjoining bathroom with double-vanity and Italian-style shower. Custom-made (sur mesure) Kitchen and Bar made in France (Cuisines Schmidt). Two contemporary bar stools (tabourets). Dishwasher (Bosch), refrigerator, microwave, induction cooktop (Brandt), oven (Siemens, high-end). Coffee maker, Nespresso (Krups; bring own capsules). 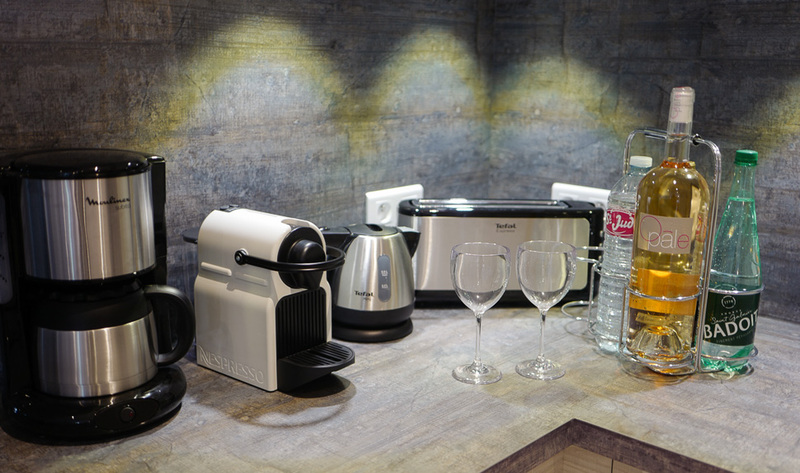 Primarily French, Italian and German appliances, tools, accessories, cookware, dishes, glassware for every purpose and tableware. Equipped by a chef and restaurant owner to go beyond the bare minimum found in most vacation rental kitchens. Spacious Terrace and Sunning Area - Full Length Ocean View: Both covered (dining; grilling) and open (sunbathing; 4 lounge chairs) areas. Outdoor shower for rinsing (planned). Balcony with tasteful rail (sailboat lifelines). Teak and wicker outdoor seating / conversation area and matching dining table (seats 6 - 8), both with pool and ocean view. Approx. 98.7 m2 / 1,055 ft2. Entertainment and Connectivity: Samsung 40" / 102cm 4K Smart TV. Apple TV and major US & FR streaming providers supported. Sonos PlayBar with wireless smartphone connections. Master Bedroom: SONY 32" / 81cm 4K TV with Netflix, YouTube and Google Chromecast. Bose Soundlink Revolve+ portable Bluetooth speaker. 5 port USB charger. Each bedroom: Sonos Play:1 wireless speaker on a USB charging stand. Internet, work desk and wireless laser printer (on order; supports AirPrint for Apple i-devices). Private massages available on-site, French-trained ostéopathe, Fanny Bordaries. You’ll be transformed. Imagine your dream car here at Villla Ouanalao, perfect fit. Langouste froide et salade, Fish Corner. 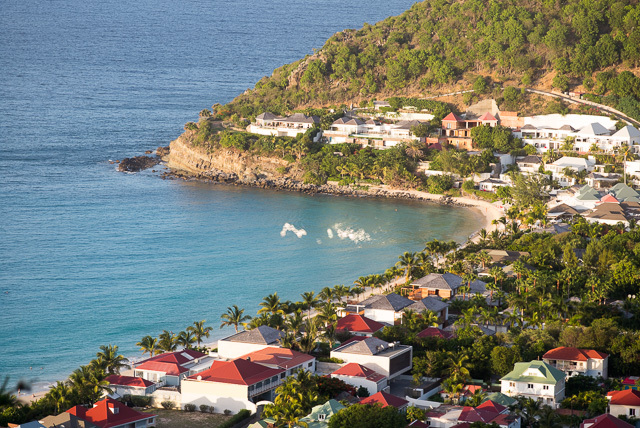 Why Not A last Minute Pre-Christmas Trip to Villa Ouanalao in St. Barthélemy, FWI ? SPECIAL OFFER - SAVE UP TO $1,365 ! Thank you for your fabulous response to our launch ! Click for our Winter & Spring availability summary. Full Summer moon over Villa Ouanalao and the 23ft / 7m pool overlooking the open Atlantic. Simple lunch of local mahi-mahi, grilled at Villa Ouanalao. Our advertisement planned for publication in the September 2018 edition of France-Amérique Magazine (bilingual U.S. magazine of French culture and lifestyle). 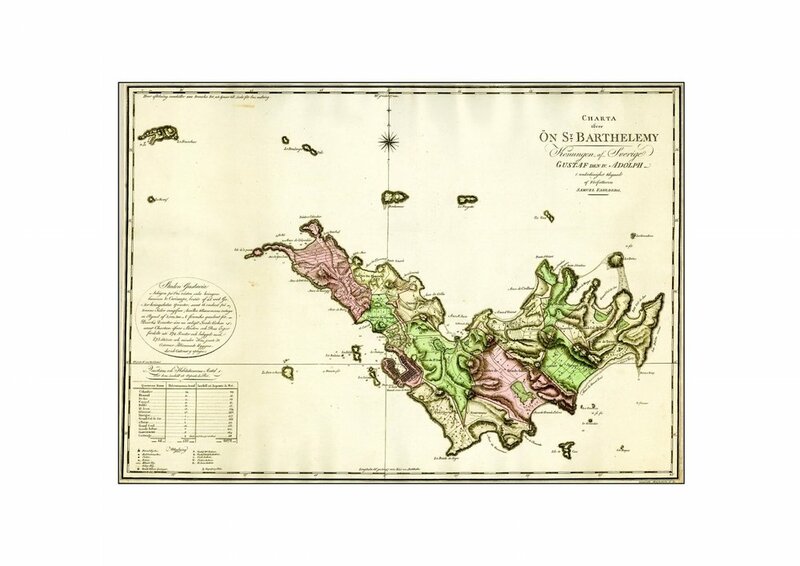 Accompanies an excellent profile article of Saint-Barthélemy. 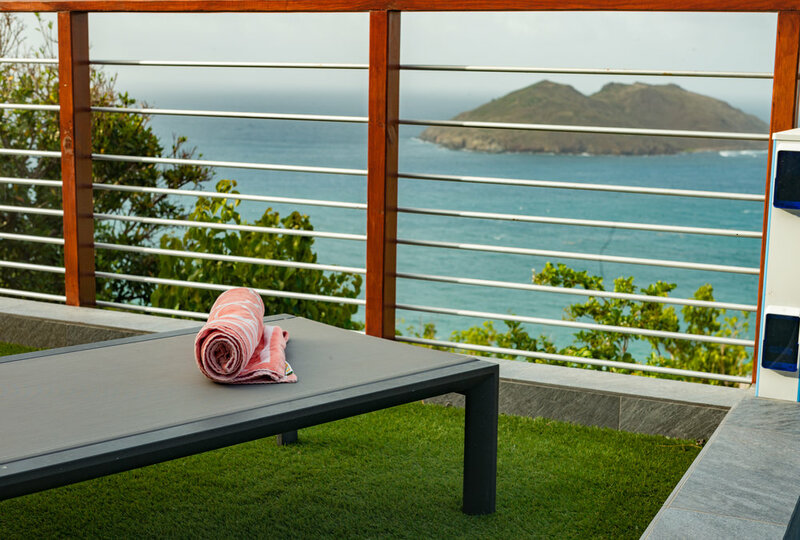 Visualize: Just part of your sundeck view from Villa Ouanalao. Dual decks at each end of the 23ft (7m) swimming pool maximize your enjoyment of both morning and afternoon sun. Escape your cares where reality stops as you look out over the endless Atlantic view. 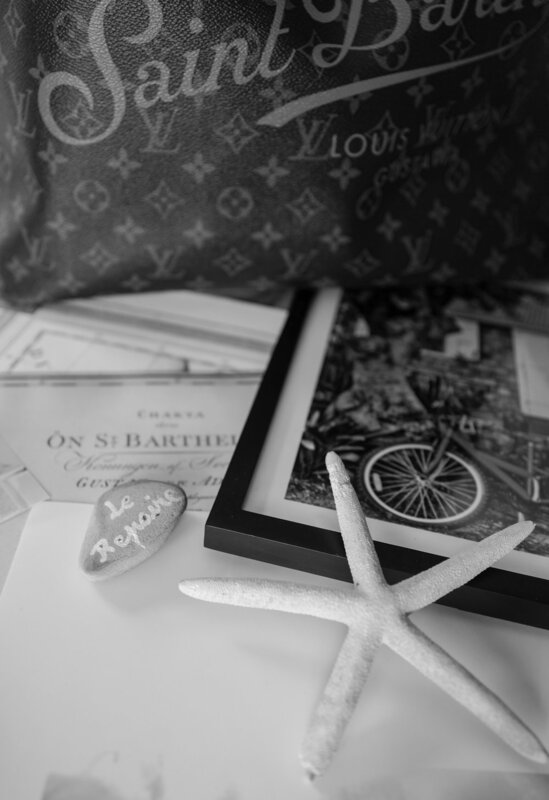 Discerning Travelers: Those who appreciate the panoramic sea view, convenient location, décor, terrace and sundeck. Those who recognize the strong value proposition. Small Groups: Friends / relatives traveling together or families needing 2 bedrooms. (Write us if you are more than 4 people.) Let us know if you need an additional nearby accommodation for a larger group - we may be able to help with an adjacent property. 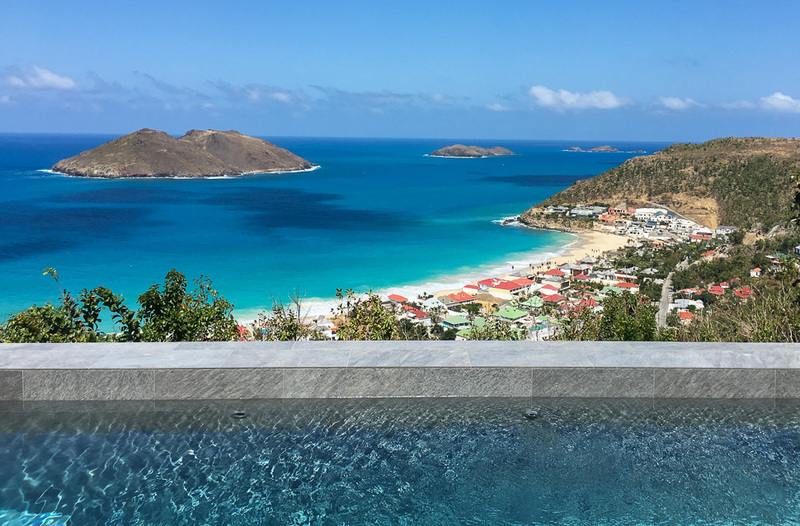 Habitués, Empty Nesters, Retirees: Already know St. Barts well and have satisfied your need to splash out on the mega expensive rental villa experience ("been there, done that")? Or travelling just as two, want full comfort, but don't need a larger villa? 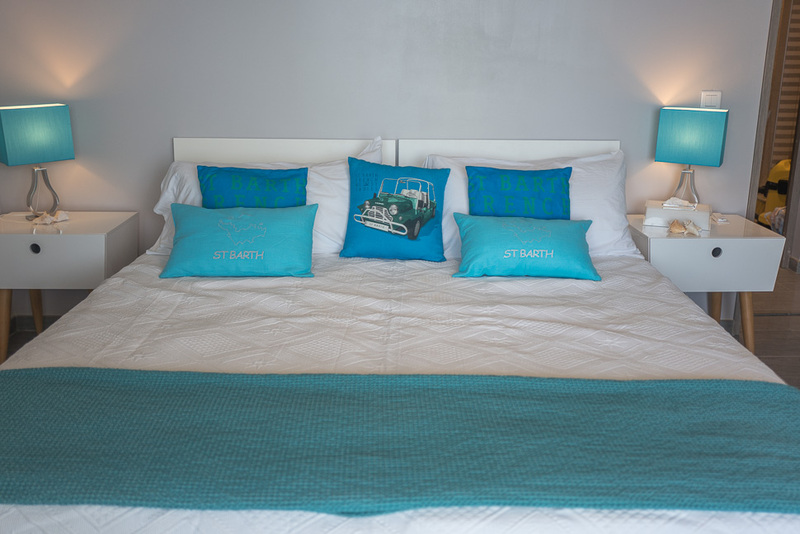 You've learned that by renting smartly, you can return more frequently or stay longer. 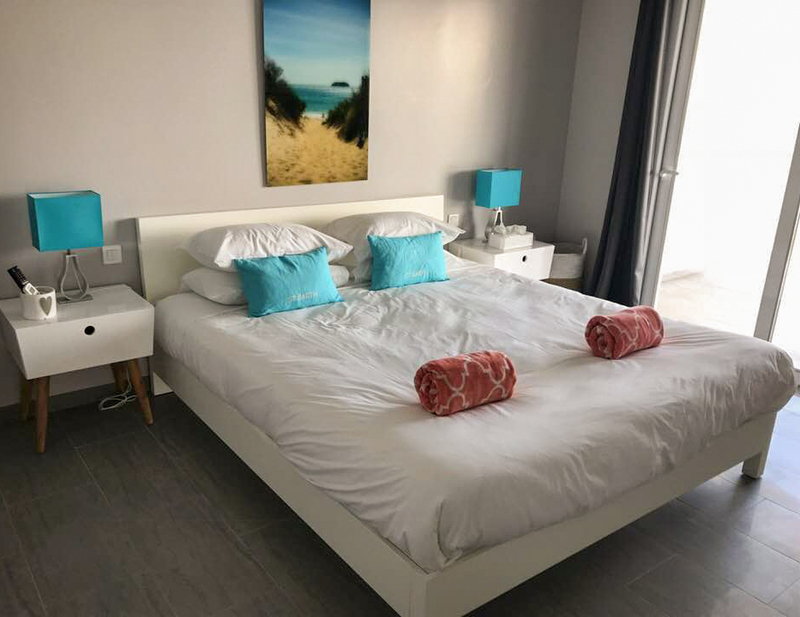 A Change of Routine in Uncertain Times: Ouanalao and St. Barthélemy are perfect for those looking for an alternative to the Riviera / Côte d'Azur, North African or other Mediterranean resort destinations, while still enjoying a European feel and quality standard. C'est la France et donc l'eurozone. Your Euros are always welcome at Ouanalao. Longer Stays: Travelers looking for an affordable way to spend more than just 7 - 10 days. Ouanalao is great value for anyone looking to take a month or more off without compromising comfort and style. Foodies / Gourmands / Convivialité: Ouanalao's kitchen is designed and equipped for those who view cooking as relaxing, passionate creativity, not just a chore. 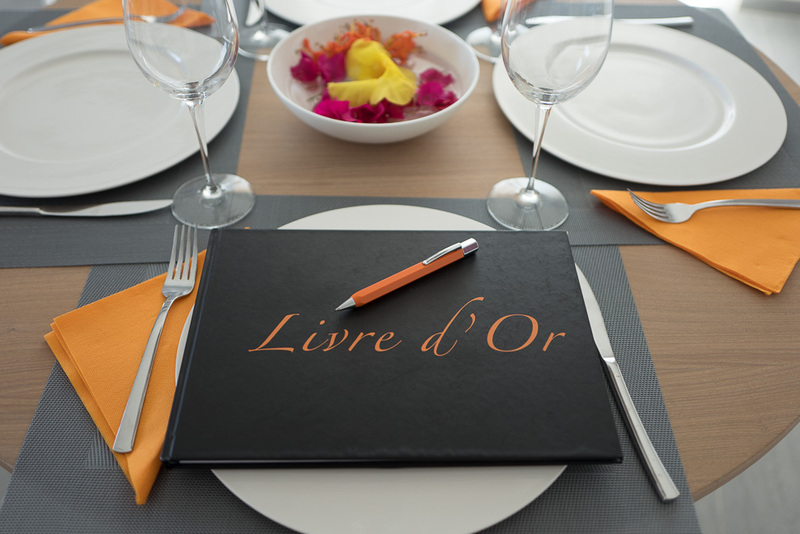 Those who want to use free time to make and share their own creations based around the wonderful European groceries, Caribbean produce, fruits, spices and local fish / seafood that Saint Barthélemy offers. Renewal and Inspiration: People seeking a tropical retreat in order to regroup thoughts and life priorities. Or creative types (authors, photographers, musicians, artists) needing time and new inspiration for a special project. Go ahead, start that next best selling novel ! 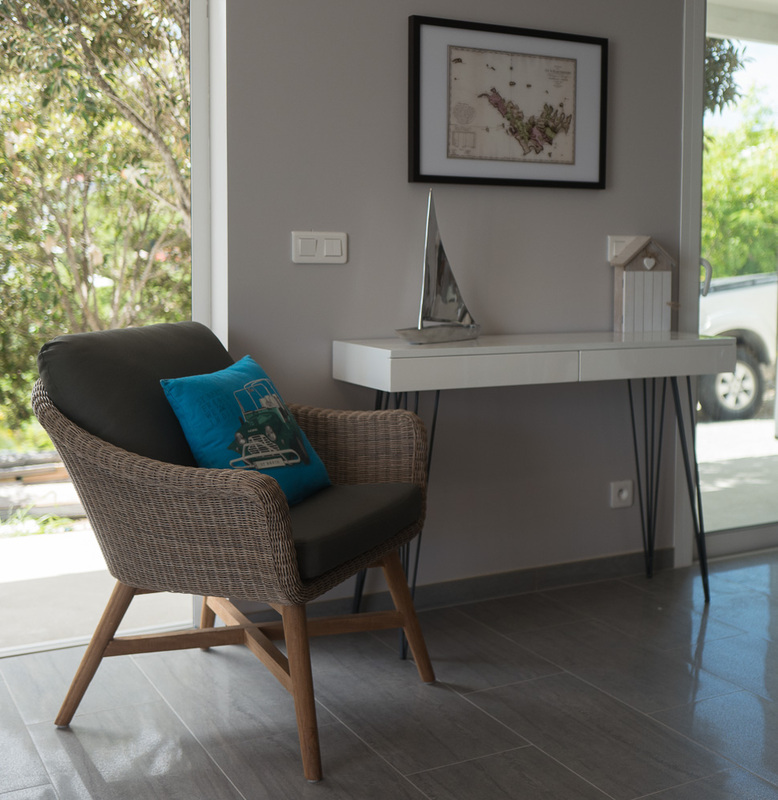 Keeping in Touch: For those who may nevertheless need to mind personal or professional matters off-island: internet, flat rate long distance land line (planned), good cell coverage, work desk and comfortable chair, laser printer (on order). Remote working with best office view anywhere.